I apologize for only have one photo today. I've been trying to take more shots of my manicures, including outdoor pictures, but I just wasn't satisfied with any of the pictures I took for today, so I had to go with the one photo that was, in my opinion, relatively decent. Anyway, Zoya Breezi is a dusty, medium-toned Aegean blue creme. This polish is from Zoya's Summertime collection from Summer 2011. It's dustier and deeper than Zoya Robyn. The formula on Breezi is fantastic. She was almost a one-coater, but I did 2 because there were a few thin spots. 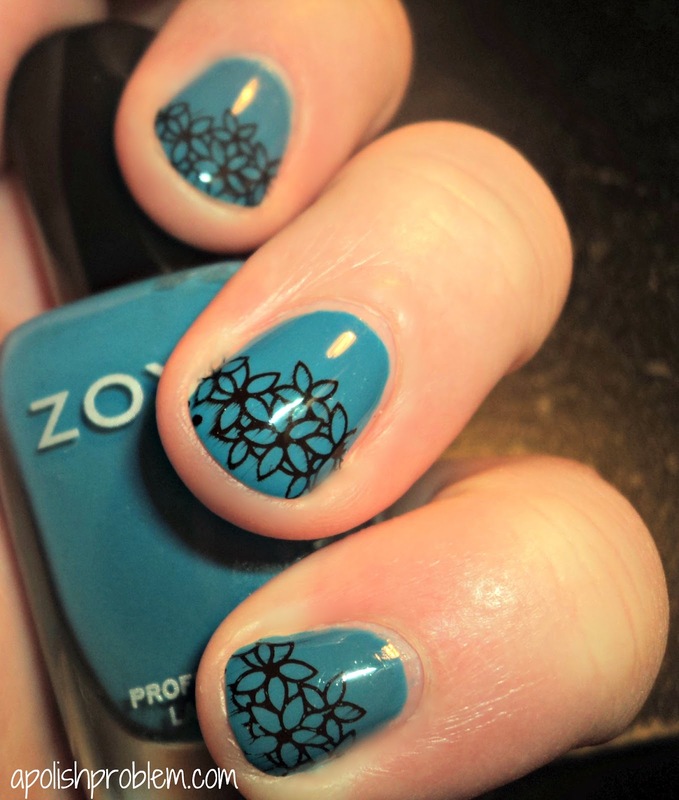 I just realized that I have used several Zoyas in my "30 Days" posts. I'm guessing that's because, at some point, Zoya has replaced OPI as my favorite brand. OPI will always have my favorite pro-wide brush, but I am finding myself constantly impressed with Zoya's formula and their color range. Zoya Breezi is available for purchase from Zoya's website. Zoyas retail for $8 a bottle, though I highly recommend that you follow them on Facebook and/or Twitter, as they frequently offer promotions. And because no manicure is no complete with out something over it, I went with a simply konad design over my tips in Konad Black Special Polish (which streaked on me something awful, despite waiting several minutes for it to dry) using a floral design from Konad plate m51. Thank you so much for reading my "30 Days of Blues" posts. I hope to be back posting collection reviews within the next few days, in addition to the blue polish posts. I had a nasty break on my middle fingernail that I'm trying to grow out just a bit. So C U T E!!!!! I adore the flowers. Even if you only share one pic it is still great to show the detail of the flowers. Keep the blogs and swatches coming. I hate streaking. Doesn't that drive ya nuts? Looks awesome. And yes, streaking drives me bananas. :) The Konad Black polish is the worst, too. I even waited about 7 minutes to apply my TC and it still streaked. Grrr. It's much less noticeable, IRL, but the macro is what counts. LOL. It's a gorgeous shade and it is one that would look perfect on just about anyone. I'm very pale, and I think it looks good and doesn't give me dead hands or red-hands, but I think it would look just as good on just about anyone. Thank you, it really is a perfect blue. It's great if you want an ocean blue, but one that's a little dirtier/dustier. I love this! The color and the stamping, love both lots and lots!